A recent piece by Platts asks whether the hoo-ha over the 800,000 b/d “missing barrels” in 2015 flagged by the International Energy Agency in its March Oil Market Report (OMR) gone a bit too far. The “missing barrels” is the uncertainty in the supply/demand balance, or the difference between the IEA’s estimate of daily global oil supply and demand. In its March OMR, the IEA said this: “We have also re-analysed our data for floating storage and oil in transit and further reduced the uncertainty in the supply/demand balance that is described as “missing barrels”. The figure usually described as such is now 0.8 mb/d, well within the normal range considering the vagaries of oil data. Once upon a time there was a "missing barrels" story. The story goes back to 1998/1999 when the Oil Market Report (OMR) of the IEA was blamed for the reason of price panics of 1999. The report became under attack when it showed almost 2 Mb/d stock built and miscellaneous to balance for the year 1998 in its Annual Statistical Supplement - the perceived existence of ‘missing barrels. Several speculations have been made about ‘missing barrels.’ Mabro stated that there was an upward bias in IEA’s production estimates. Horsnell claimed that ‘missing barrels’ were almost certainly comprised of firstly an underestimation of World oil demand, and secondly an overestimation of OPEC supply. Matt Simmons emphasized that ‘missing barrels’ simply cannot be true because it is not possible to hide that much oil even though there exists many off-shore storage facilities, meaning something is wrong with the data. The IEA broke down 2 Mb/d “missing barrels” into its components and reduced it to 1.6 Mb/d. Later on, the case was closed. We witness another price panic in 2005. This time, the prices go up. Apparently, supply cannot meet ever increasing demand, because Chinese are drinking oil! Therefore, the IEA and all others demand production increases. The August 2005 issue of OMR shows that in the 2Q2005, some 2.7 Mb/d is “missing,” the biggest ever “missing barrel” reported in the OMR, if I am not wrong. 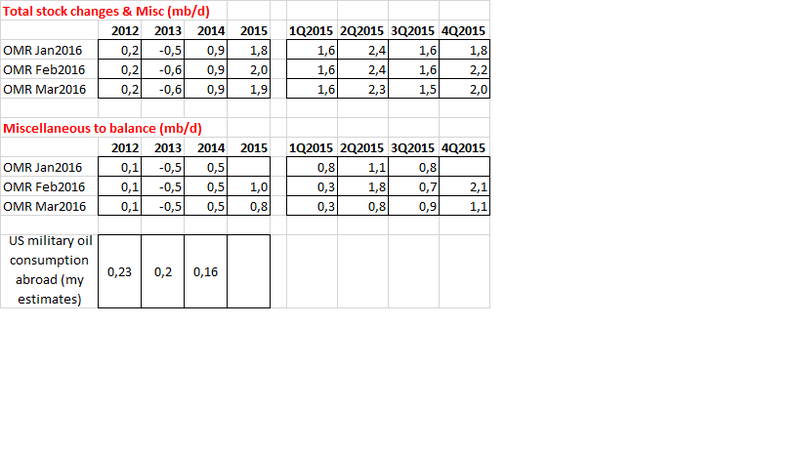 If 2.7 Mb/d produced oil is somewhere out there, why the prices are going up? Is it that easy to stock that much oil, as Simmons once argued? If yes, why are we crying for more oil? Or am I missing something? The Oil Market Report of the IEA was blamed for the reason of price panics of 1999. The report became under attack when it showed 1.9 Mb/d stock built and miscellaneous to balance for the year 1998 in its Annual Statistical Supplement - the perceived existence of ‘missing barrels.’ Recently, those “missing barrels” came back on the world oil balances and yet nobody makes any comment. In fact, there has never been “missing barrels,” there has been missing statistics! Or bad statistics. There I underlined that: conversion factors (from metric ton to barrels) are the Achilles' heel of the world oil supply-demand tables. 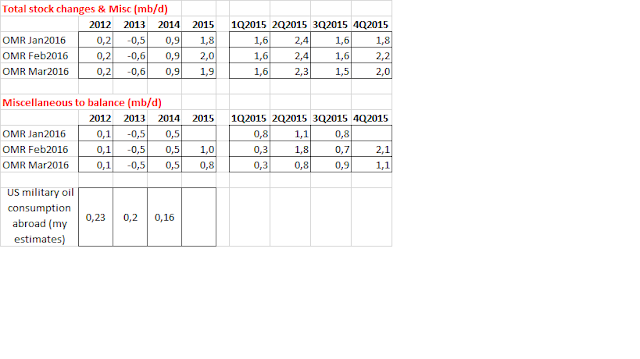 Note that the figures in the IEA’s oil supply-demand tables are expressed in thousand (or million) barrels/day which are converted from metric ton using volume to mass ratios in barrels/ton. OECD Member countries report their oil statistics in metric tons. All those figures are then converted to barrels at the IEA by using…, well that’s the main problem. AND I have written several times on my blog that the US military oil consumption abroad does not appear (missing) in world oil supply balance sables, including Table 1 of the IEA. My estimates are given in the Table below. So, everybody must get the statistics right before blaming the IEA! I respect you and your works too so I followed on twitter too.